Heat oven to 350°F (325°F for dark or nonstick pans). Spray 1 (9 x 5-inch) loaf pan with cooking spray. Line bottom of pan with parchment paper. Place paper baking cup in each of 9 regular-size muffin cups. Make cake mix as directed on box using water, oil and eggs. Pour 2 1/2 cups of batter in loaf pan; pour remaining batter evenly into muffin cups. Bake loaf 40 minutes; bake cupcakes 20 minutes. Cool loaf in pan 5 minutes; remove cake from loaf pan and cupcakes to cooling racks. Cool cupcakes and loaf completely, about 1 hour. Using long serrated knife, trim triangle-shaped piece from corners of one end of loaf; reserve pieces. With knife, round corners of other short end of loaf. For the frosting: in large bowl, beat cream cheese, butter, milk and vanilla with electric mixer on low speed until smooth. Gradually beat in powdered sugar, 1 cup at a time, on low speed until frosting is smooth and spreadable. In small bowl, mix 1/2 cup frosting with green color until desired color. In large bowl, mix remaining frosting and orange color until desired color. Bring reserved cut edges together at the bottom of cake to form carrot tip. Hold together with some of the orange frosting. 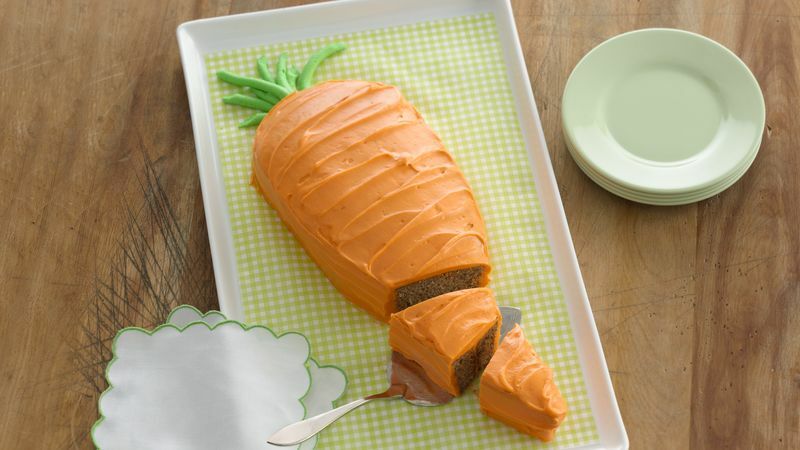 Use remaining orange frosting to frost carrot. Use green frosting to make the carrot top. Use remaining orange and green frosting to create carrots and carrot tops on cupcakes. Serve cupcakes with cake. Serve this fun cake on a green platter to resemble a field.